abbreviation for acute nonlymphocytic leukemia. 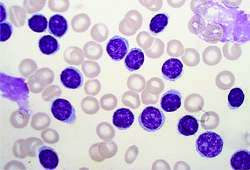 See acute myelocytic leukemia. Q. 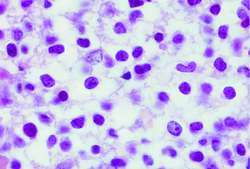 What types of cancer are AML and ALL? I have a friend who got sick with this bad cancer at the age of 35. He has told me has ALL but I am not familiar with this type of cancer. A. 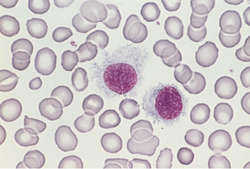 ALL and AML are both types of Leukemias, i.e blood cancer. They are not representing an actual tumor, like breast cancer or prostate cancer, but instead they represent an uncontrolled production of blood cells of different kinds, that take over the bone marrow (where the blood cells are normally produced), and disturb with the entire circulation system. These cancers are treated with intensive chemotherapy drugs and bone marrow transplantation. Q. 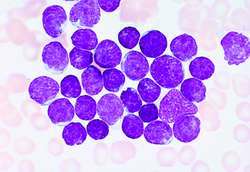 Are there any specific treatments for acute myeloid leukemia caused by myelofibrosis? My husband was diagnosed with these conditions. His oncologist believes his AML was caused by his myelofibrosis. (scarring of the bone marrow) This was shown on his bone marrow biopsy. Myelofibrosis is a myeloproliferative disorder. Meaning certain blood components, such as WBCs, RBCs, platelets increase significantly in the marrow. A. Thanks for taking the time to reply to me. I'll see about inquiring his oncologists. For both ALL and ANLL, the relationship was observed for the indicators of proximity or density of main roads and of [NO. The results clearly demonstrated that there could be a broad spectrum of karyotype abnormalities and heterogeneity in the telomerase activity in different FAB subtypes of MDS of and ANLL patients. In CML patients 8q13 has been reported in translocations other than Ph and 4q 11 was reported in association with ANLL (8), (18), (20).